Over the years of my professional coaching career I've had many younger players asking me how to be a good right winger and what skills they will need to develop, so we'll try and answer this today. When a player says that they play the number 7 or 11 position, they are often alluding to the fact that they are wingers. The number 7 often plays along the right wing (right winger) while the number 11 is positioned along the left wing (left winger). To be a good right winger you basically have to be constantly running along the right sideline into space, tackling opponents and crossing the ball to teammates. So, in order to play the position effectively you will need to be have great pace and be ready to play hard defensively and offensively. You have to be able to make successful run ins around the defenders and know when to pull wide or tuck inside. In modern soccer, the coaches often position their very talented players in wide positions such as the right wing. As a skillful winger you should be able to use your pace and tactics to find space along the flanks and try to always outwit the opposing team’s backline. So, if you want to know how to be a good right winger, the following content will help you understand what is required of you. The video below shows a couple of basic drills that could help you sharpen your skills when playing on the right wing. This is possibly the most physically demanding position that you could play in a match. It involves plenty of running, cutting in and out, one-on-one tackling and lots of ball crossing. You could be playing in the defensive half for a while then have to sprint back to the opposing goal mouth for a set piece. So, in order to fulfill the duties of this position effectively, you will require a whole lot of cardio exercises to build endurance. In order to outplay opposing players on the flanks you need to have lightning bursts of speed. It would be impractical to be a slow paced winger because you would be unable to effectively run into space and create chances. Having a fast right winger with great technical ability is a key element for any team. Since the sidelines are often less crowded than then center of the pitch, if you’re a right winger you have more space to show your dribbling skills. When you’re in the right wing position you will regularly have one-on-one encounters with the opposing teams wingers and defenders. For this reason you should ensure that you do intensive dribbling drills which will allow you to find ways of getting past opponents. Check out this cool video for some tips to enhance your dribbling skills along the wing. As a right winger you will be required to cross the ball more than players in other positions. You may also be responsible for corner kicks which offer scoring opportunities for your team. For these reasons you need to have exceptional crossing ability whilst running with the ball and in dead ball situations. David Beckham is a legendary number 7 who was famed for his excellent crossing ability, crisp passes and free kicks. This great technical ability helped his team score goals and earned him plenty of accolades. The video below will help you enhance you learn a couple of tips that could help you learn how to improve your crossing skills. Right wingers are expected to defend when facing attacks from the opposing team. When playing in this position you will have to learn how to mark your opponent even when making runs. In addition to this, you’ll have to sharpen your slide tackling which is important when retrieving the ball and also as a way of slowing down a fast paced opponent. Use your skills and trickery to get past your opponents at all costs. If you have enough pace you can cleverly keep the wingback at bay by dribbling the ball close to the sideline. Alternatively you can get past your marker by executing a one-two pass past him which sets you up for a long cross. It is important to remember that when you are in your defensive half it is safer to pass the ball than try to beat your man because losing the ball could lead to a counter-attack by the other team. Check out these five awesome moves you can utilize to beat your man. If you beat the opposing team’s winger a couple of times he is likely to give you space and try delay tactics rather than one-on-one tackles. When this happens the central midfielder often arrives to give support thus limiting your movement. If you anticipate this move always try and pass the ball to your teammate before it happens. You can shoot a direct pass to your striker or pass through-balls down the flanks. The stop-and-go move is very effective for a right winger as way of beating opposing defenders who are approaching from the side. It a great soccer trick that is used to confuse opposing defenders and delay their reaction time. For instance, you can pretend to cut the ball backwards then abruptly move forward down the flank. There are plenty of variations of this move and when executed well it can leave opposing players flatfooted. Create set pieces by cutting inside, then passing the ball and heading towards the goal area. When doing this remember to run diagonally to avoid going into an offside position. The diagonal run is best executed when the central midfielder is holding ball because it confuses the opposing defenders. A great diagonal run can create a breakaway that could easily lead to a goal. One of the most notable players to utilize diagonal runs effectively is Bayern Munich’s Arjen Robben. Have a look at this perfectly timed diagonal run to see how the experts do it! Avoid being too predictable with your moves. Use different moves and tricks to keep the opposing defenders guessing. Do one-twos with the central midfielder, dribble along the sideline, Switch balls to the left winger, try cutting in and taking shots and even long balls above the heads of the opposing defenders. Remember that being unpredictable is a great weapon when facing another team. 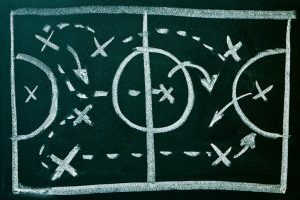 I hope this article has helped you understand the roles of the right winger or number 7 player in soccer. If you play in this position keep practicing and try and improve your skills whenever you are on the pitch. What skills do you think a right winger needs? Who are your favourite right wing soccer players? Show us some of your tricks to beat a defender!